A patron at the Ellsworth transfer station opens the back of her car outside the facility's recycling building on Friday, Jan. 4, 2019. As of Feb. 1, the city will stop accepting several types of material, including glass and boxboard, as a result of changes in the global recycling market. 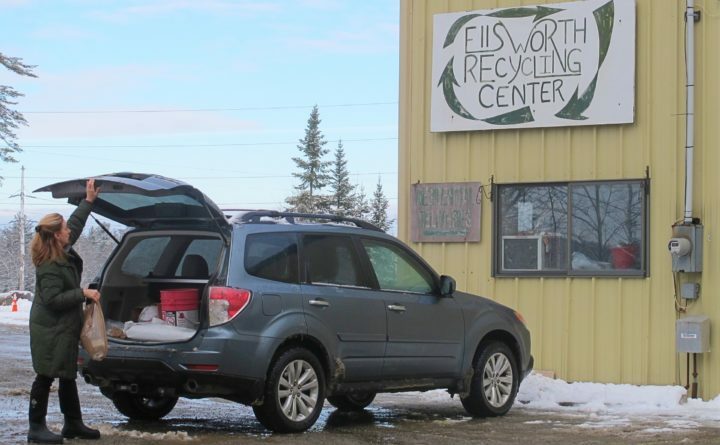 As of Feb. 1, Ellsworth will become the latest Maine municipality to significantly curtail its recycling program because of changes in the global recycling market. After the end of this month, the city’s transfer station will no longer accept glass, several types of plastic, boxboard items such as cereal boxes, or office paper, according to Lisa Sekulich, Ellsworth’s public works director. It will continue to accept corrugated cardboard, types 1 and 2 of plastic, aluminum and steel cans (but not aluminum foil), and newspapers, magazines, catalogs and advertising inserts, she said. Because it is a global issue, she added, other Maine municipalities are facing similar difficulties. Glass, boxboard, types of plastic containers categorized 3 and higher, aluminum foil and office paper “unfortunately” will have to be lumped in with the rest of the household trash, which residents pay $3 per bag to have hauled away, she said. An organization owned by a number of Portland-area municipalities, ecomaine, handles recycling services for towns located mostly in western, southern and central Maine. According to information posted on its website, ecomaine also provides municipal recycling services in the Bangor-area towns of Carmel, Glenburn, Newburgh and Stetson, as well as for Lamoine and Swans Island in Hancock County. Gouldsboro and a handful of towns in Greater Bangor are among other municipalities that have scrapped or suspended their recycling programs because the global market has pushed the cost of the service well above their budgets. Area towns generally had been paying around $20 to $40 per ton to have their recycling hauled away, but since last summer have seen those prices rise to around $150 per ton. The changes have been prompted by a 2017 decision by China, the world’s largest importer of waste, to stop importing 24 types of waste from the United States, Europe and other countries in 2018, and to enforce its limits for accepting waste contaminated with nonrecyclable material. Other countries still accept some of the types of items produced in large quantities in the American waste stream, but the lack of buyers has resulted in haulers greatly increasing their prices for taking it away. Some changes already have gone into effect in Ellsworth, Sekulich said. For a while, the city still was collecting shredded office paper but was not recycling it because of the lack of demand. It stopped accepting shredded office paper last year, she said. If the market changes further to make recycling more things economically feasible, Sekulich added, the city might again start accepting some items that will be banned from its recycling center at the end of the month. Correction: An earlier version of this report misidentified where in Maine ecomaine offers municipal recycling services.